We start becoming who we are at an early age. Two milestones in particular, influenced who I am now. When I was seven years old, my father stood patiently in the dark, murky waters of Wonder Lake at the end of the pier, his encouraging voice saying, “Jump.” We put his swimming lessons to the test. Jumping in without a life jacket, I believed I would succeed in finding the surface of the water by holding my breath and wiggling through the water with my arms and legs. And, well, Dad was there. This was the first of many incremental lessons that kept me safe in the water and taught me a lot about life. Belief in positive outcomes, trust in your coach, and consistent practice will get you there. The next memory is a bit grittier than the first. My life changed the summer before high school. I was thirteen. I was diagnosed with scoliosis, a crooked spine. 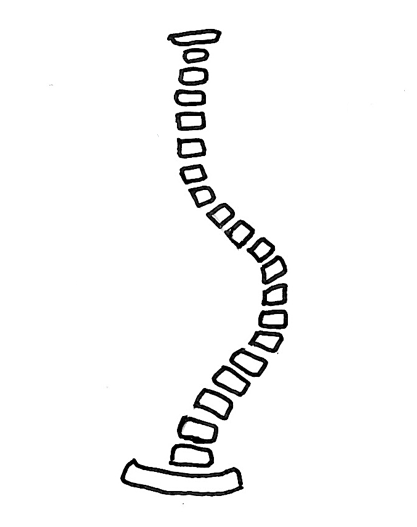 The illustration highlights the type of curvature. The treatment required a full body brace extending from my torso all the way up to my chin. Two vertical metal bars straddled my spine and connected with two leather-covered pads holding the back of my head in place. The brace was cold in the winter and the cast-like structure was hot in the summer. Immobilized from my hips up to my neck for three years, I could walk, but could not see the books I carried, nor could I eat in a normal way. Looking straight ahead was my only option. Self-awareness came early to this teenager. Turning sixteen, my Forrest Gump movie scene arrived as I walked right out of the brace. While he was being chased by bullies as the brace splintered away from his legs, I felt like my own insecurities vanished when the brace came off. In one day, I went from a fixed position to completely flexible and mobile. Dreams erupted into reality. I released the pent-up energy and ideas into a flurry of action. Filled with gratitude, I savored every moment of mobility and committed to make my actions count. Even as I write this, I regard movement with reverence every day. My study habits and good grades paid off in the form of college opportunities. What’s more, I could move, run, do backflips (literally), and drive a car. I had forged through to the other side of a major setback. My hard-won abilities of adapting to challenging circumstances came in handy as I encountered hurdles in subsequent years. Now, how did these experiences translate to the ideas of career agility and response to change? I’ve always considered myself an artist. The field of graphic design proved an ideal integration of both business and art. Impatient to succeed, I moved ahead in my profession the way gamers move from one level to the next. I navigated roles within one organization until it was time to switch to another company. The adrenaline of mastery and progress consumed me. Internal unrest or boredom led to role changes; occasionally I moved to a different company. Curiosity, learning new things, and earning an MBA, steered me to unique areas of interest and responsibility. As an early adopter of workplace trends and technology, my career path included: artist, designer, entrepreneur, brand architect, sales professional, technology marketing executive, and workplace futurist. My career in the tech sector launched a style of deliberate professional growth, guided by personal preferences and response to change. When observing agile methods by software developers and marketing practitioners, I dug deeper into the topic of agility. The agile mindset meshed perfectly with persistent workplace change. Applying these methods to career navigation, I created the Career Agility Model. The Agile Careerist Project was born. Starting with research, interviews, and stories, I developed a system of tools, workshops, and a book. The Project’s purpose is to help global workers navigate careers and change while optimizing creativity, growth, and happiness. If you are still reading this story, thank-you. Cheers to the beginning of a conversation about the way we work and the future of work! The best way to share and stay connected is by joining the community of people who want more from their life’s work. Simply enter your email.